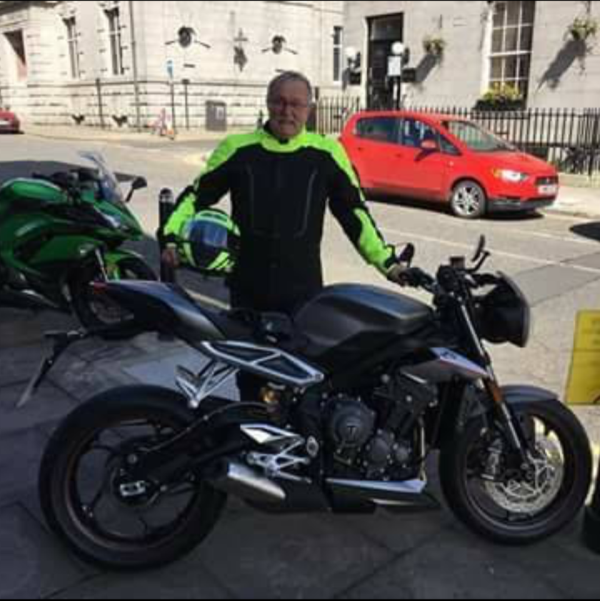 "On a sunny day in August 2016, after over 50 years of accident free motorcycling I had my first serious off. On the way home from a perfect day riding with a friend on Royal Deeside, I was side swiped by a Volvo 4x4 which came barrelling round a partially blind bend on my side of the road. I was squashed between an earth bank on my left and the Volvo on the right. The Volvo wing mirror hit me full in the right side of my chest which resulted in the handle bars being pulled to the right. The front wheel dug into the side of the Volvo and broke. This sent me flying over the handle bars on to the road. The bike was written off and I was carted off to Hospital in Aberdeen. The Volvo driver admitted full responsibility and was charged by the attending police at the scene. The extent of my injuries took several visits to the hospital to be fully appreciated. During the initial period, the third party's insurer was very helpful and arranged for physiotherapy. They telephoned several times to ask how I was but when the full extent of my injuries became apparent they advised I should see a solicitor. Fortunately, I had been to a local motorcycle convention in Alford and met Rod Mitchell on the Motorcycle Law Scotland stand. I had kept his card and decided to give Brenda Mitchell a call to ask for advice. It was apparent right from this initial conversation that this was a very wise decision. It was obvious she knew and understood about bikes and Brenda arranged for me to meet with Jodi Gordon and between them, together with the rest of the MLS team, they did an absolutely amazing job on my behalf. They secured an excellent settlement for my bike, helmet and jacket within a very short space of time. The compensation claim took a while longer but in the interim Brenda arranged for me to see a number of Medical Consultants who provided additional evidence in support of my claim. Throughout the process they both kept me up-to-date on the progress and provided support throughout. Just a month short of two years the claim was settled in full securing a sum which was many times more than I could ever have dreamed of. Even at the ripe old age of 71, I can’t get bikes out of my system so a new Triumph Street Triple RS now sits in the garage for me to polish. Sadly, due to the lasting effects of the injuries no long continental trips any more or the sorts of runs I used to look forward to but on sunny days I still manage the odd few miles. Prior to my accident I managed several properties and carried out both minor and pretty serious renewal and renovation projects which are also now beyond me, but the compensation now allows me to pay for others to do the work! If you are ever involved in an accident and need of a solicitor or legal advice give Brenda a call. I can guarantee it will be well worth it. Thanks Brenda and Jodi and all at MLS."